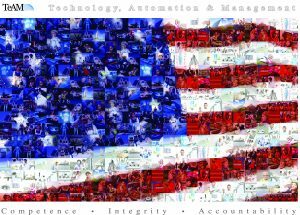 Technology, Automation & Management Inc. (TeAM) has delivered high quality services to the Department of Defense (DoD) and other federal agencies for over 30 years. TeAM has successfully managed programs in Engineering, IM/IT and Informatics, Healthcare, Medical Research, Infrastructure and Operations, and Education and Training domains. TeAM has successfully developed solutions to problems encountered, defined and executed mission requirements, stayed under budget and on schedule, as well as sustained positive business relations with all of our customers.